Fame MS 58 Mk II Dynamic Microphone. After seeing the Fame MS 58 microphone suggested by someone in the Live Sound forum as being much cheaper but better sounding than a Shure SM58, my interest was piqued so I ordered one. For comparison, on DV247s web site, a Shure SM58 is currently £87.10, and the Fame £17.20 (excluding postage, and it will come from Germany). Fame is the in-house brand of Music Store Professional based in Cologne (who are fronted by DV247 in the UK) and covers a whole range of musical products including guitars, amplifiers, drums, keyboards, PA, microphones and all sorts of accessories. They are all budget priced and Chinese made items, but seemingly offering good value for money. The MS 58 Mk II, is an obvious SM58 look alike, though physically the mic body is is slightly longer and the grille mesh is wider spaced. The comparison SM58 is probably at least 15 years old, maybe older, but is well cared-for as it came from Tim Rainey's studio, so it hasn't had a hard life on the road. The Fame grille has a slightly different thread to the Shure, so they can't be swapped. The mic capsules look very similar (externally at least), though the Shure one sits slightly lower in its housing. 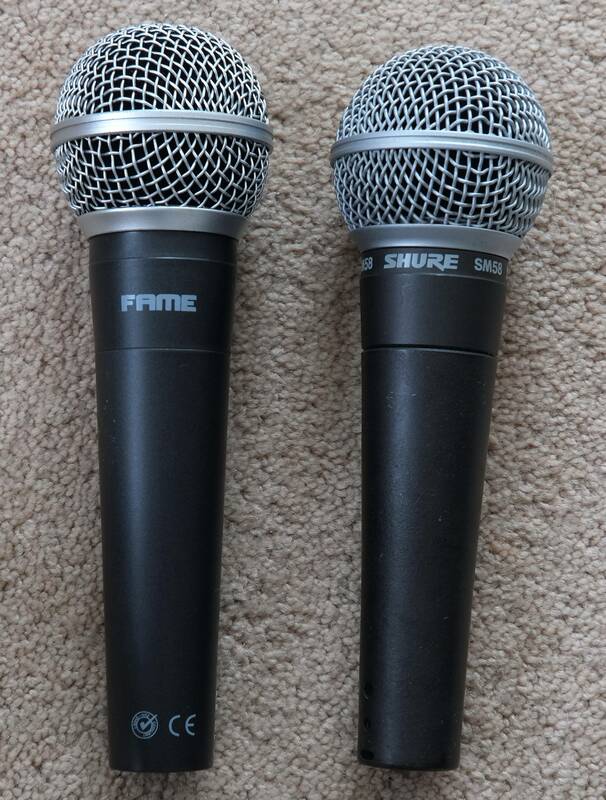 The Fame MS58 is a much lighter microphone than the Shure SM58, weighing 186g vs 313g respectively. 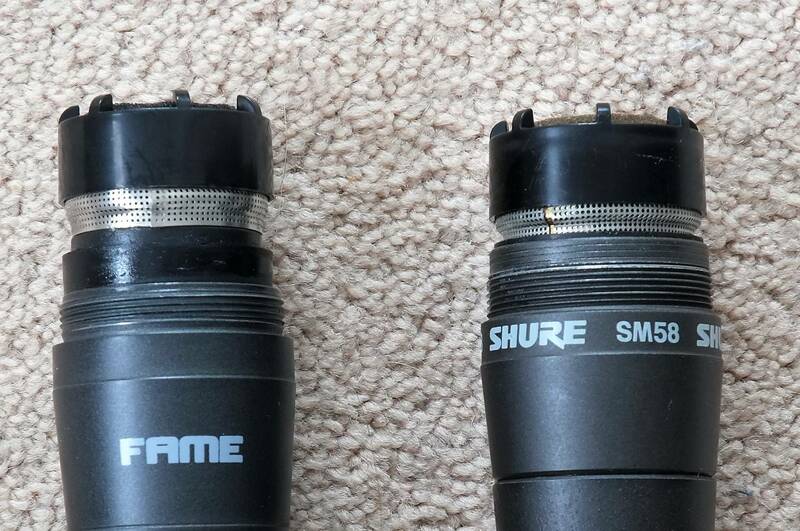 The Fame body splits in the same way as the SM58, with the lower 4/5ths unscrewing to reveal a direct connection from the capsule to the output XLR, with no epoxied-in transformer like on the SM58. A closer inspection reveal that the Fame is wired for unbalanced use, with pins 1 and 2 linked. Completely unnecessary! I set up an rough frequency response test to compare the two mics by positioning them at a point about 100mm away in-between the driver and tweeter of one of my Genelec monitor speakers, and then recorded the mics output whilst outputting a pink noise signal to the monitor. I then used Cubase's frequency analysis tool to get the response from a 10 second section of audio for each mic. 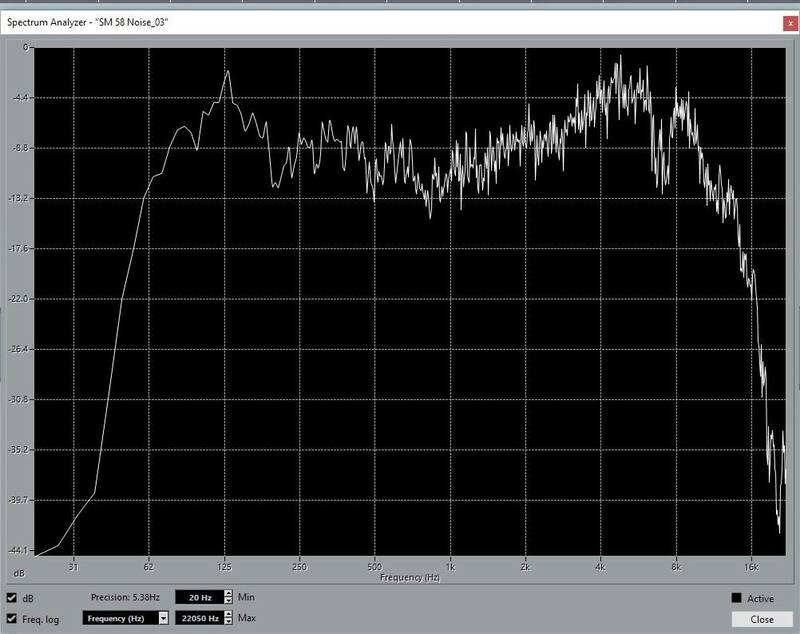 I cut off the lower part of the frequency response for the Fame mic, as I wasn't sure how accurate it was, as unlike the Shure, it stayed pretty high in the top part of the graph all the way to 15Hz instead of falling off like the Shure did. 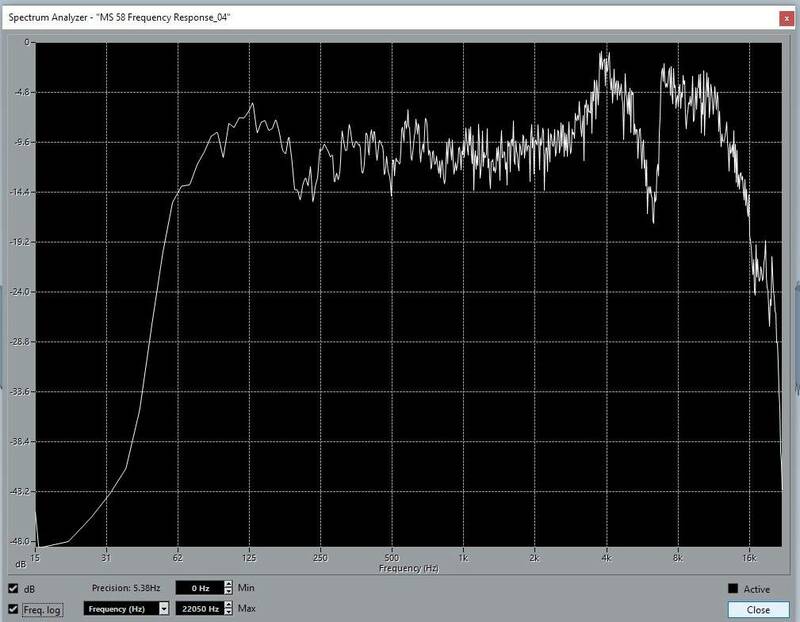 It's obvious to see that the mics have a very different frequency response, with both exhibiting some proximity boost at the bass end, but the Shure remaining fairly flat above that until its response starts tailing off above 10kHz. the Fame on the other hand, has a very pronounced high-end boost, but with a very noticeable dip at around 6kHz, with almost scooped mids. One thing the graphs don't show you (though you may have guessed from the unbalanced mode of operation) is that the Fame's output was significantly lower. Its average RMS level was around 7.5dB less than the Shure, so you'd certainly need to jack up the gain on your mixing desk if you used it as-is. I then did a rough vocal test of both using headphones (to avoid any feedback). The SM58 sounded as it should do, with significant close-up bass boost but otherwise a reasonably detailed and pleasant sound. The MS 58 on the other hand, was all bass and top end, Not pleasant at all, a very scooped sound. Apart from being significantly quieter, the other thing not apparent from the pink noise test was the level of noise produced, probably as a result of it being unbalanced. I was using a longish XLR lead, maybe 15 metres, which would be reasonably typical overall for stage use. With the SM58 it was just silent when I wasn't speaking. with the MS58 it was "hello seaside! ", loads of high frequency noise (not mains hum) very clearly audible. I found that I don't own a small enough screwdriver with a big enough handle in order to undo the XLR fitting screw (it's done up really tightly), so couldn't snip the link to pin 1 and try it in balanced mode and see if the noise level improved. So I've ordered one (well a nice set) and hopefully tomorrow can report on what difference the mod makes to the sound. But as it is, I think I've definitely found a worse mic than the C1000, and it doesn't even have the benefit of being robust enough to use as a hammer or door stop etc. Re: Fame MS 58 Mk II Dynamic Microphone. Clearly there's been some considerable effort at reverse engineering that capsule, but it looks like they missed on some o the more important constructional details! If you do manage to get at the XLR, it would be worth checking how the casework is grounded (assuming it is, somewhere!). Ideally it should be via a swaged link directly between pin 1 and the body. (It's not unknown for RF pickup to occur where a short wire (which acts as an aerial) has been used to link pin 1 to the body in other mics!) However, it is conceivable that it's via the capsule itself, and that might account for the high level of background noise you experienced. The other useful check would be to assess it's absolute polarity, and whether a positive acoustic pressure wave generates a positive electrical output waveform. Sounds like it might be inverted from your description. I've dug out the multimeter and on this mic, the body isn't connected to ground at all. 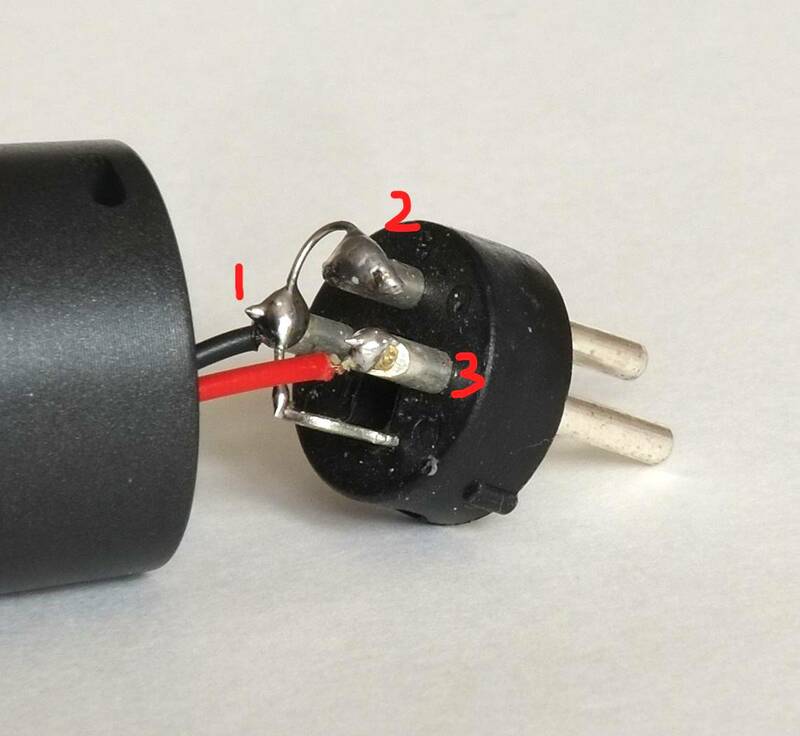 The XLR fixing screw goes into a metal insert in the plastic XLR body, and the internal end of the metal insert appears to be soldered to Pins 1 and 2, but there is no continuity between the body and pin 1 or 2). The XLR screw itself is making good contact with the body and I get a happy beep and a low resistance value, but somehow the screw isn't making proper contact with that insert, which as the fixing screw should be screwed into the metal insert, is something of a mystery at the moment. I used to sell those things back in 79 and 80 when they first came out. They were so cheap that they sold like hot cakes. They were first distributed by Monacor in Germany, along with other cheap Chinese mics. They had all sorts of brand names in different markets, but all had the MS58 and MS57 badge. There was a range below them that just had the badge DM- followed by a number. They sounded even worse! They were built in China and distributed via Taiwan. I'm glad to see that they are still out there! The Red Bladder wrote: I used to sell those things back in 79 and 80 when they first came out. They were so cheap that they sold like hot cakes. So now we know who to blame! Hi Wonks, interresting article. Is it possible to place some more pictures abiut the connections on the inside. If it’s possible to change the wiring will it be still a cheap mic? I will do once I can get the XLR connector loose. Dave, you can try this Fame out at a rehearsal (once it's modified), just for a laugh! OK, screwdrivers arrived, so the XLR insert in now out of the body. The screw got slightly chewed up a) because its quite soft metal and b) I was trying to screw it out, when I should have tried to screw it in to the XLR so that it no longer held the XLR insert in place and it could be withdrawn. It's been a long time since I last did this! So here's the XLR. I've numbered the pins so that it's clear to see that pins 1 and 2 are connected, and that there's also a link from pins 1 and 2 to the metal tab that holds the XLR grub screw. What isn't quite so clear and difficult to photograph, is that the link to the tab doesn't actually make contact with the tab. 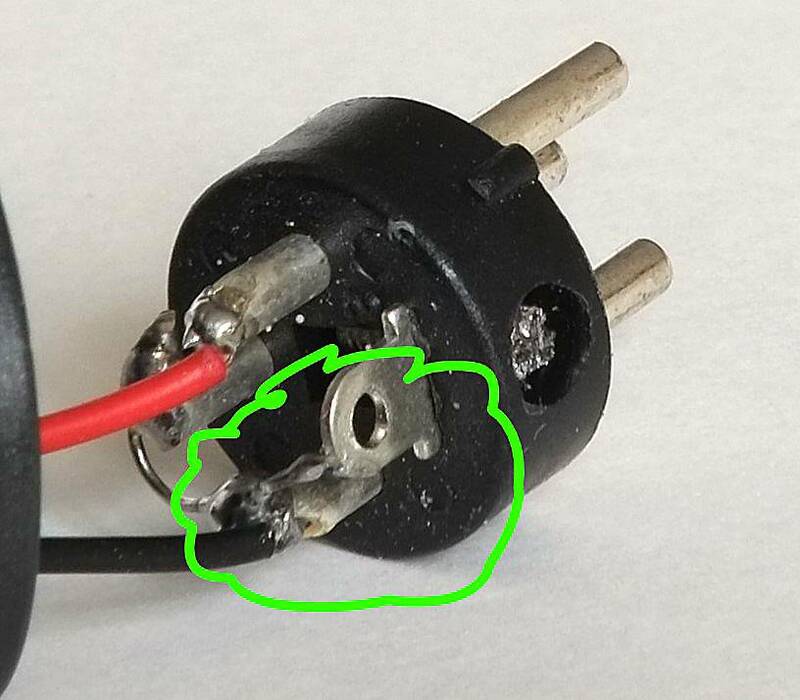 Although the wire link has some solder on it, it's failed to bridge the gap between the link and the tab, which is why the body remained un-grounded. So it's time to fire the soldering iron up and see what we can do to improve things. Okay... So since all the soldering looks a bit rough and ready anyway, why not de-solder the XLR completely, clean it up, and then re-wire it with the red wire on pin 2 (assuming the red wire carries a positive voltage for a positive air pressure*), the black on pin 3, and link pin 1 straight across to the chassis tab. An as-is polarity test with me going 'pup' into the mic shows that the polarity appears correct as it was wired, so it's out with the solder sucker. Okay. Red on 3 and black on 2 it is! Hugh Robjohns wrote: Okay. Red on 3 and black on 2 it is! I know it's right, but that feels so wrong! Modifications made to the MS 58; pin 1 (ground) linked just to the XLR screw tab, Pin 2 (+) black wire, pin 3 (-) red wire. This has made a significant difference to the mic. The output signal level is now about equal to the SM58 and all the noise has gone. The Fame MS 58 Mk II now sound a lot closer to the SM58. The MS 58 still sounds slightly brighter to my ears, and more prone to sibilance and has the more obvious handling noise. I've re-done the frequency response charts (using white noise this time which I should have done before) and they now look closer. 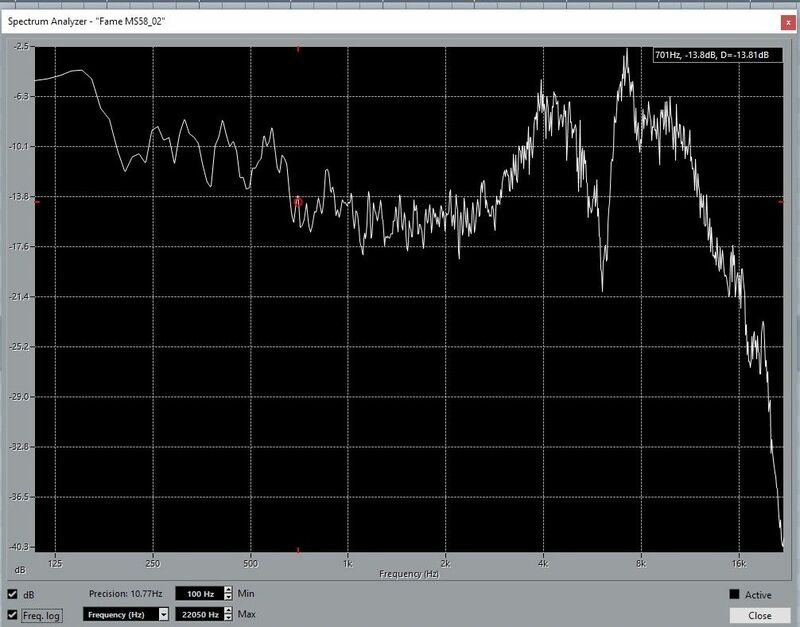 The previous sub-60Hz response peak on the Fame MS 58 has now gone. (I did also use pink noise for comparison as I'd used that before and the LF peak was gone from that as well). The mics were again positioned in between the main driver and tweeter, 10 cm from the monitor. Note that these are rough graphs and the results would look slightly different given perfect test conditions, but I think they are good enough for a comparison. Here's the Fame MS 58 Mk II. And here's the Shure SM58. 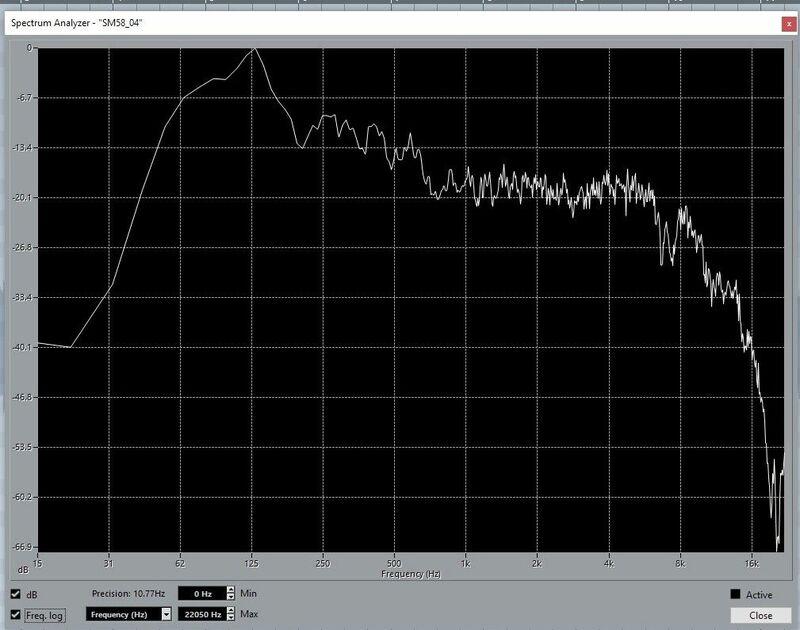 The Fame still shows higher frequency peaks than the SM58, and the dip in the response from approximately 4.5kHz to 6.5kHz is a lot greater than the dip in the SM58's response between approximately 6kHz and 8kHz. With my voice, the mics showed similar response to plosives, but the Fame sounded overall a little bit brighter and suffered more with sibilance. Please note that I can't hear above 10kHz any more so the mics may sound more different to those with better ears than mine. The SM58's body is filled with epoxy and a transformer, which partly explains its increased weight over the Fame. But that epoxy is probably also responsible for helping damp the mic body, resulting in a lower handling noise than the Fame. The SM58's handling noise was quite low in frequency, so would lessen when a HP filter was used, whereas the Fame's handling noise was maybe twice as loud and generally of a much higher frequency, so less likely to be reduced with a HP filter. You probably wouldn't notice it being hand-held in a loud rock track, but it's more likely to stand out with a singer hand-holding the mic in a piano accompanied ballad. What I haven't been able to do yet is see how feedback resistant it is in a live situation. Or know whether it has the robustness of a real SM58 and will still be working in 20 years despite looking severely beaten up. I omitted mentioning a few minor things that I planned to in the initial review, so here they are for completeness. 1) There is no polar pattern diagram for the mic at all. The mic is simply described as 'unidirectional'. 2) The mic came supplied with a 5/8" threaded plastic mic clip, very much like a Shure clip, but there was no 5/8" to 3/8" adapter included. 3) There was no plastic pouch for the mic supplied, as is often the case. So I really need to revise my opinion of the Fame MS 58 from my initial opinion. It definitely needs converting to balanced operation and ensuring that the shell is grounded; which if you can use a soldering iron, is a matter of a few minutes. It will be slightly brighter sounding than an SM58, which will be good for some voices and bad for others, but probably nothing turning down the treble on the desk couldn't cope with. It's going to be best left on a stand rather than being hand-held. So for a £17.20 vocal mic when on a tight budget, then providing you can modify it, I think it's doing OK. I'd still recommend going for some of the more professional budget offerings such as the AKG D5, which is under £70 and regarded by many as a lot better than an SM58, but if you've only got £25 spare and you need a stage mic, then given basic soldering skills, then it's going to be useable. Thank you Wonks for this nice review and lot of work. A worthy investigation. Thanks Wonks. Well, as bought, it was. As modified, it's probably a bit better than one. Though you'd never knock a nail in with it.